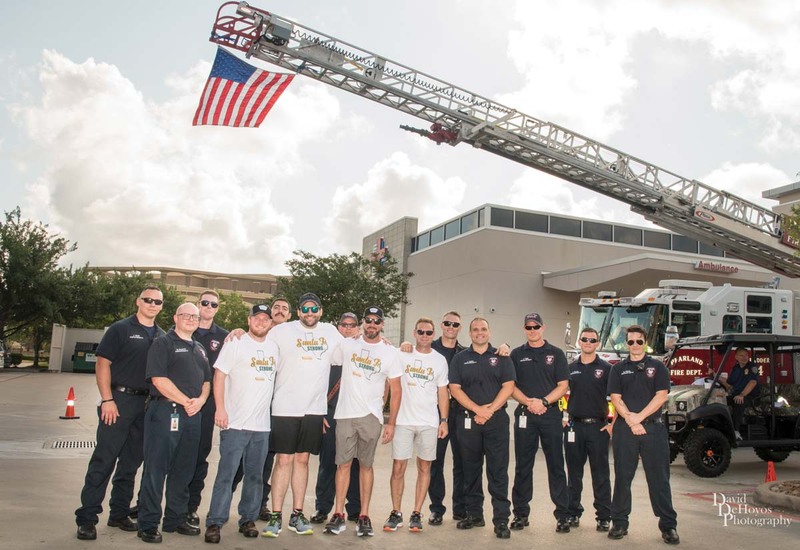 Pearland Firefighters with Executive Chef Matthew Jackson, Clear Lake Grazia’s Andrew Howell, Adrian Hembree and Pearland Council Member Gary Moore. Photography by David DeHoyos. The Hembree family: Ryan, Stephanie, Adrian and Gina. Grazia in Italian means “grace,” a name that restaurant owner Adrian Hembree is completely committed to living up to. 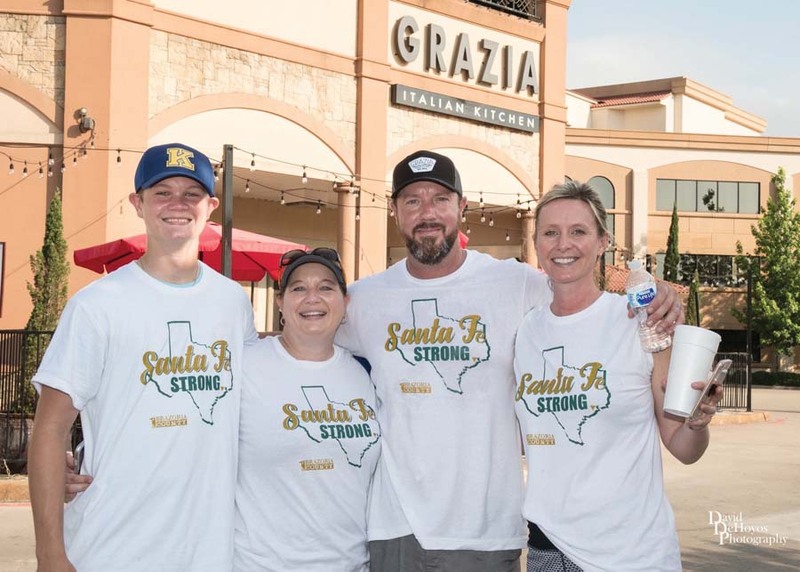 Aside from offering great food, Grazia offers a lot back to the community; things such as holding benefits for local softball teams and the Lions Club. Adrian says that between the Pearland and Clear Lake locations of the restaurant, they raised around $200,000 in 2017 to give back to the community. They even set up a taco drive to benefit the victims of the recent Santa Fe High School shooting. The idea for the taco drive actually came earlier, in 2016 when he wanted to do a benefit for the family of a Pearland officer who was killed by a drunk driver. “The idea was simple, it was the catalyst to have something bigger,” Adrian said about the event, adding that between their $5 tacos, a local woman selling shirts and other donations, they raised around $40,000. The menu features items like Cajun dusted scallops, redfish with a crawfish cream and lasagna wrapped into egg rolls. The important question is, what does Adrian recommend? But the Mike & Jen, so named for his brother and sister-in-law because Mike is the person who came up with the idea for this dish, and while Adrian thought it wouldn’t work, it is now a best seller on the menu! Just don’t let Mike know, Adrian still tells him it doesn’t do very well. To give himself a little credit for his own menu, he says you can’t miss out on the Adrian’s Art Pizza, which is a pizza topped with all of his favorite toppings – including wagyu meatballs and house-made Italian sausage. Adrian himself has never been to culinary school, but he has worked his way up through multiple Italian restaurants. He gained a love of cooking from a home economics class in high school, where he first learned to make pizza, a recipe his parents still use! He learned to cook partially from two Italian men he met at his first job, an Italian restaurant, in college, and partially through product development training through previous jobs. He calls himself “a product of the street” in the kitchen. When people come to his restaurant, he wants them to feel comfortable and welcome. “What’s important when we meet a first time guest is that they feel like family.” He adamantly shares his appreciation for those who choose to dine at Grazia. He said he wants a visit to Grazia to feel like a visit to Grandma’s house, where you get a warm and caring feeling.